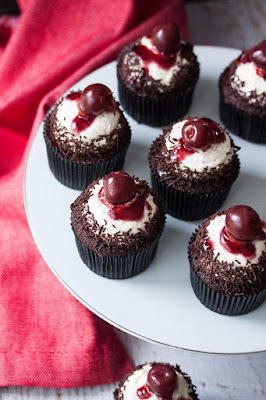 BLACK FOREST CHOCOLATE CUPCAKES WITH CREAM CHEESE FROSTING HAVE ALL THE FLAVOUR OF BLACK FOREST CAKE IN CUPCAKE FORM AND AN IRRESISTIBLE CREAM CHEESE FROSTING. Preheat your oven to 180C / 350F 160C fan forced. Line your muffin tins with paper cases. In a bowl, sift together the flour, cocoa, baking soda, baking powder and salt. Mix well to combine. Add 1/3 of the flour mixture to the butter and sugar. Stir through gently until just combined. Now add half of the buttermilk, Mix gently again. Continue like this until all the flour and buttermilk is combined... just. It is important not to overmix or be too heavy handed otherwise your cupcakes will turn out dense and tough. Fill the cupcake cases only to just over half full. Bake in the oven for around 18-20 minutes, turning the pan around in the oven half way through to make sure they bake evenly. When a skewer inserted comes out with just a crumb or two, they are done. In a saucepan over low heat, combine all ingredients and bring to a gentle simmer. Continue to simmer, stirring occasionally so that it doesn’t catch, for around 20 minutes or until the liquid has almost disappeared. Once the cupcakes and jam have cooled, use a knife to cut a small hole in the top of each cupcake (just under an inch round). Fill the holes with about 1 teaspoon of the cherry jam. In a stand mixer with a paddle attachment, beat butter and 1⁄2 cup of the icing sugar until light and creamy. Scrape down the sides of the bowl often. Add the cream cheese and beat well until thick and creamy. Scrape down the bowl again. Add the vanilla and salt and beat through. Add the sugar 1⁄2 cup at a time and beat well after each addition. Finally, add the milk or cream and beat for a final couple of minutes. The mixture should be pale and creamy. 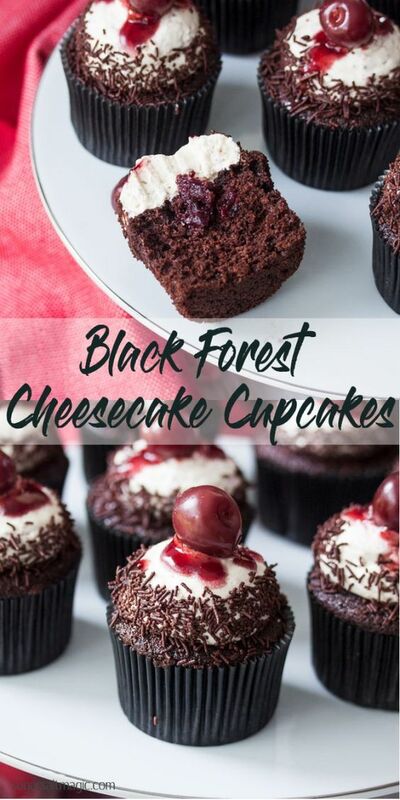 0 Response to "Black Forest Chocolate Cupcakes with Cream Cheese Frosting"